In this weekend's Bullseye with Jesse Thorn interview, we hear from Paul Reubens, the actor behind Pee-wee Herman. He's working on a new Pee-wee movie, and we get to hear about his early days playing Pee-wee. Let's go! Jesse Thorn: You spent your teenage years in Sarasota, Florida, which, besides being a nice retirement community type place, is also the off-season home of Ringling Brothers? Paul Reubens: It was at the time I lived there, yes. Jesse Thorn: So was that part of your life as a kid and as a teenager, that there was just circus stuff around? Paul Reubens: Yeah. There was circus stuff everywhere. My high school had a circus. I think it's the only high school in the world with a full circus program, and kids that you would have classes with, you know, all year long, that you wouldn't have any idea that they would be these circus stars, and then you'd go to the Sailor Circus...that's the name of the Sarasota High School circus, The Sailor Circus, and you'd go to the circus and see a girl that sat in front of you or a guy who sat off to the side, and they'd be wearing tights, and they'd climb a web and do a full-on flying act or walk a tight rope. It was absolutely incredible. Jesse Thorn: You trained in The Groundlings in the '70s, and while you were training, one of the first big things that you did in show business was go on The Gong Show, and not just go on The Gong Show once, but go on The Gong Show a whole bunch of times. What was the first act that you brought to The Gong Show? Do you remember? ...I got a call from a girl that I knew very well, one of my friends in Boston, and she said, "One of my best friends, who came in the year after you, just moved to California, and she wanted to get your number." So I gave her my number, and this girl called me, and she said, "I just was on The Gong Show, and I joined the union, and I almost won, and if I'd won, I would've made $500." And it was I think $238 to appear on the show union scale wage. And she said, "I want to do another act," and I was thinking maybe we could do some kind of a duo act. So her name was Charlotte McGinnis, and she and I became a duo act called Betty and Eddie, and we wrote an act specifically for The Gong Show. We went on, and we did it, and we won. I joined AFTRA, the American Federation of Television and Radio Artists, and that allowed me a year later to join the Screen Actors Guild. It was a way in on something that was very difficult to do. A lot of people didn't have those opportunities, and I made money. We won money, and then I got all kinds of booby prizes. There were all kinds of things that they would send you, and when the shows would rerun, they would send you a residual check and another prize. 3. He Doesn't Consider Pee-wee's Playhouse "Weird"
Jesse Thorn: ...My guest is the actor, writer, and producer Paul Reubens. If you know him, it's either for his many appearances on The Gong Show or because he's the creator and voice of Pee-wee Herman. I'll tell you what's really interesting to me about the relationship between Pee-wee Herman, and Pee-wee's Playhouse, and The Gong Show, and some of the stuff that you did on The Gong Show. That it's this kind of '50's and '60's culture that in the '70s and '80s was often being sent up, and what you're doing there and what you did with Pee-wee's Playhouse, isn't really a send up? It's more like a what if we did that thing that was so, so straight in its time and just bent it around the corner a little bit, made it a tribute, but a really weird tribute. I mean, I wonder if that was your intent or something that you were aware of? Paul Reubens: No. You know what? I was with you right up until the very, very last thing you said. I never...I wouldn't try to get into a debate with you about whether it's "weird" or not. I've certainly heard the word weird applied to both the show and me and lots of other uses of that, but I never look at it like that. We never tried to be a kid's show but weird. It's funny. I was just talking to some people who have a fake lounge act, and they were saying we're starting to become what we parodied, and I had just seen their act, and I didn't feel like that at all. I feel like it's really about the commitment, you know? I always feel like my commitment to Pee-wee Herman...I don't mean that the way it came out. I mean the concentration and the commitment required to be that character and to stay in that character just makes it real to me. I guess I do agree it was an homage in many ways. I mean, I loved all these kid's shows that influenced me, and I tried to sort of mix ingredients from all of them into what I wound up doing. So it's kind of a throwback, and it has lots of homage elements to it, but I always considered it a full-on real kid's show, even though it had all this innuendo and adult humor in it, we did the same show in matinees for kids. So I always felt like I took a lot of pride in begin able to figure out ways to do stuff that could be seen by kids and grownups, and two different audiences might pull two different things out of it, but it could be seen by the same group. Jesse Thorn: When did you decide that Pee-wee the character would live outside of the world of the performances and that Paul Reubens, the actor, would become pretty much invisible? 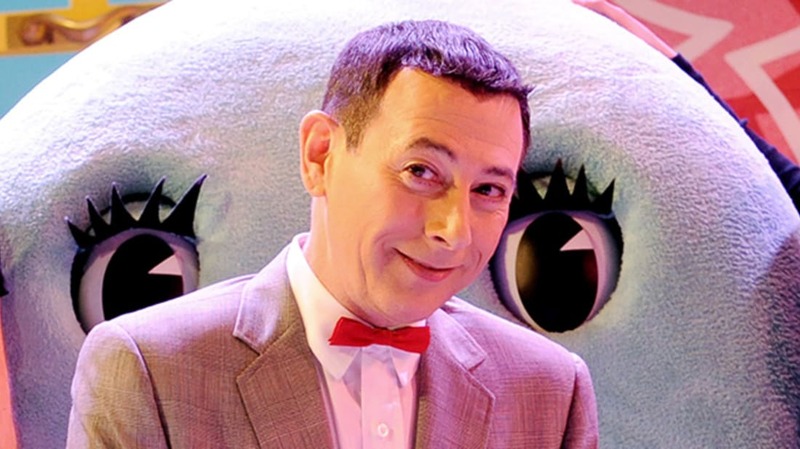 Paul Reubens: I was very influenced by conceptual and performance art, and I always felt like Pee-wee Herman had some strong elements of that, and what made it even more interesting to me is that no one know that except me. I always felt like it was conceptual art, but no one knew it because I went out of my way to make people feel like Pee-wee was a real person. So when you're talking about doing interviews, I don't know where I came up with this or why I did it. It was just something that just was a gut feeling I think, that Pee-wee Herman just worked way better as a real person. That if you were going, oh, that's an actor, it was very different than going, wow, who in the heck is that? One of my earliest things I did with Pee-wee Herman is I went on a cattle call audition for The Dating Game. Female Speaker: Bachelor number two, I can't stand it when a guy's too easy. How are you going to make things tough for me? Paul Reubens (as Pee-wee Herman): Well, for one thing, I'm going to wear a body suit underneath my clothes! Paul Reubens:To go out and go to an audition and walk in with that suit, and bowtie, and my hair slicked back, and white shoes, and talk in that voice...you know, they said sit down over here, and please fill out this form, and the form was a "what are your hobbies," that kind of thing, and I would write down I enjoy cleaning my room, and going to the library, and all this nerdy, dorky stuff, and I could just tell that the people thought I was real and were acting one way to me, but thinking something else inside, and I knew I was going to get on the show before I got home. Female Speaker: Bachelor number two, what's your best-used line for your come-on to any girl in a bar? Female Speaker: Boy, I'm running away right now. Jesse Thorn: You've been developing a new Pee-wee movie for a few years now. You wrote a script with a Los Angeles comedian, writer, and actor named Paul Rust. Lately, you've been intimating that it feels very imminent. I wonder what it's like to work professionally in a world where, to some extent, you can see the imprint that you've left, because I think that in the comedy world today, people who are my age, around 30, who were kids when the Playhouse was on, or 35 or 40, who were kids when Pee-wee's Big Adventure came out, it has affected them and affected the work that they do. Paul Reubens: I see that sometimes. I know what you're talking about. It's less based on the work and more based on how people act around me sometimes where I feel like, wow, this is how I am around Lily Tomlin. It took me many, many, many years to be around Lily Tomlin and not feel like I don't know how to act, I don't know how to concentrate. Like, you're my idol. I feel like I'm just thrown off, and I've certainly been in that situation, and that's all I can chalk it up to. I feel like, oh my god, I'm clearer now on how awkward that must've felt to Lily Tomlin if she even picked up on any of it, which she probably didn't. Oh, but you know what? You were talking about Paul Rust, and I want to come back to Paul Rust for a second because he certainly has told me he was a fan, and I know that he knows a lot about Pee-wee Herman. Paul Rust is someone who I met through the producer of the movie, Judd Apatow. That was the first clue I had that Judd was going to be right about so many things. We just worked seven days a week for five weeks straight doing a rewrite on it that we just turned in last week. I hope he's going to be on the set when we're shooting every day so if there's anything that needs to get rewritten, he's there to help. Jesse Thorn: So, Paul, you just said you hope he's going to be on the set when you're shooting. Do you feel like you're going to be shooting? Paul Reubens: Oh, yeah. We've hired a director. We have a start date. It's show business—there's certainly the possibility it could all fall apart—but at this point, I mean, I've got it in my calendar for an eight-week shoot and post-production, and we start pre-production in two weeks.